DO-39756-64 was succesfully added to your cart. 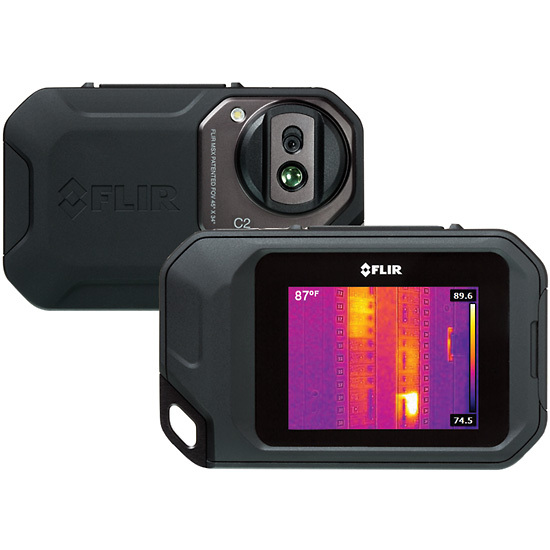 The FLIR C2 is a full-featured, pocket-sized thermal camera. Designed for contractors, building industry experts, and anyone that needs a pocket-sized thermal camera. The slim, light profile fits comfortably in your work pocket so you can always keep your camera at your side and never miss an opportunity to uncover issues. Use it as a nondestructive assessment tool and a reliable way to verify the success of completed repairs. The 4800-pixel resolution, high-sensitivity detector captures and displays subtle thermal patterns and small temperature differences. Full radiometric – the camera stores 4800 individual measurements on to each JPEG image that can be then be fully analyzed using FLIR Tools software. Flir Tools software – with the included software you can analyze, change color palettes and access both thermal and visible imagery to create detailed reports. MSX image enhancement – adds key details from the onboard visible light camera to the entire infrared image in real time. The result: an all-in-one, undiluted thermal picture with visible light features that lets you instantly recognize where the problematic heat pattern is. FLIR Tools software, USB cable, USB memory stick with documentation, lanyard, built-in battery, and power supply/charger with plugs. What are the pixel dimensions of the JPG images produced by the FLIR C2? measurements from -10°C to 150°C. How much storage memory do the FLIR C2 Camera's have. Do the FLIR C2 Thermal Imaging Camera's have a SD Card Slot for adding to the picture storage capability? The FLIR C2 thermal camera can store 500 full sets of images (thermal, visible, MSX) to internal flash memory.